​Most of the time cookie dough is an off-limits indulgence that you may dip into on a Friday night while watching a movie at home…only to wake up feeling guilty the next day. Sure, you know you should resist, but sometimes you simply need a sweet, satisfying treat. 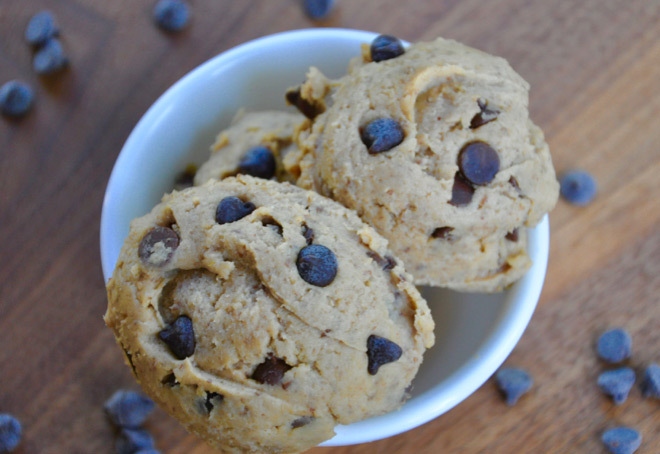 Enter this exciting new recipe for Guilt-Free Cookie Dough! It has all of the creamy, cookie dough goodness that you crave without the regrettable ingredients. Instead of butter, flour and sugar this cookie dough treat is made with creamed chickpeas, peanut butter (or almond butter), stevia and a touch of honey. 1. Combine all of the ingredients, except the chocolate chips, in a food processor. Blend until smooth and creamy. Add more coconut milk if needed. 2. Transfer the dough to a bowl. Mix in the chocolate chips. Enjoy!